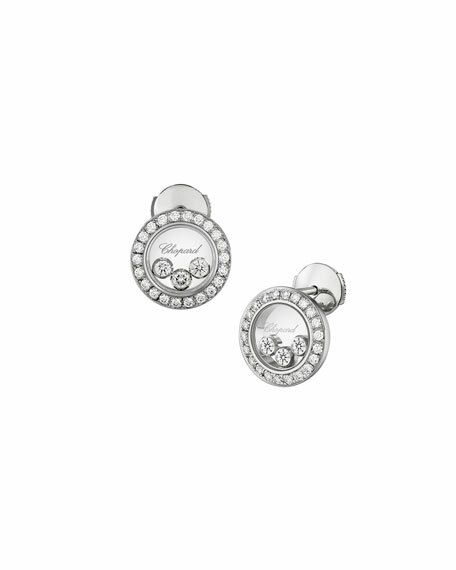 Chopard earrings from the Happy Diamonds Collection. Three floating diamond bezels at center. 50 diamonds; 0.70 total carat weight. For Chopard, the art of fine watchmaking is a time-honored tradition. The Swiss-based company was founded by Louis-Ulysse Chopard in 1860 and has since become one of the world's most sought-after names for high-end watches and jewelry. In addition to Haute Horlogerie, Chopard's legendary style can be found in handbags, wallets, pens, pencils, sunglasses, gifts, and more. Core values of creativity, independence, and excellence drive each Chopard creation.